the first rail of which may be thus said to have been laid." In 2007, several agencies in the southland had events to commemorate and memorialize the 1857 completion of the San Antonio and San Diego Mail Line (SA&SD). The SA&SD was the first intercontinental communication link, joining the newly-won western territories with the Midwest and East Coast of the United States. The SA&SD blazed the trail for the Butterfield Stage route that replaced it in 1858. Several equestrian-focused reenactments happen along the SA&SD mail line and official celebration of the arrival of the first mail takes took place on August 31, 2007 in Old Town San Diego SHP. See history come alive at the Vallecito Stage Station (video) on the San Antonio and San Diego Mail Line. Find out what the archaeologists learned in the Historical and Archaeological Investigations at the Carrizo Creek Stage Station report. The archaeologists' site research has helped to write part of the stage line story once lost to the desert sands of California. 1) Carrizo Creek Stage Station is in State Parks' Colorado Desert District (CDD) and was the subject of State Parks archaeological excavations conducted from 2000 to 2003. A driving and hiking tour visited the station in February 2007. Use this link to learn more about Carrizo Creek Stage Station. 2) Vallecito Stage Station is in the midst of the CDD, however is located on San Diego County Parks property. Use this link to go to the San Diego County Vallecito website for more historical information or view San Diego County's Historical Treasures (pdf 750 kb) presentation. General information on the mail route is available from the California Trails Association. 3) Warner's Ranch Stage Station is located on Vista Irrigation District property and was visited during a driving tour in February 2007. For more history on Warner's Ranch use this link to the Library of Congress website and search on Warner Ranch. More information is available at the San Diego History website. 4) Oak Grove Stage Station was a stop on the Butterfield State Route and is located immediately adjacent to National Forest Land and on private property. This station was a stop on a June 2007 Driving Tour. For more information on Oak Grove go to the NPS Oak Grove/Butterfield Station website. 5) Little Temecula Rancho Stage Station was also a stop on the Butterfield Stage Route. The actual station location is under modern construction, but historic Vail Ranch across the street was the end stop for the June 2007 Driving Tour. The portion of the driving tour was coordinated with Temecula Valley Historical Society and Vail Ranch. Plans included a visit to the "Wolfe Store" in Temecula. Use this link for more Temecula Rancho information. In early August 2007, a driving tour to other stage stations sites in West San Diego County was held. These sites include: Santa Maria and Penaquitos. 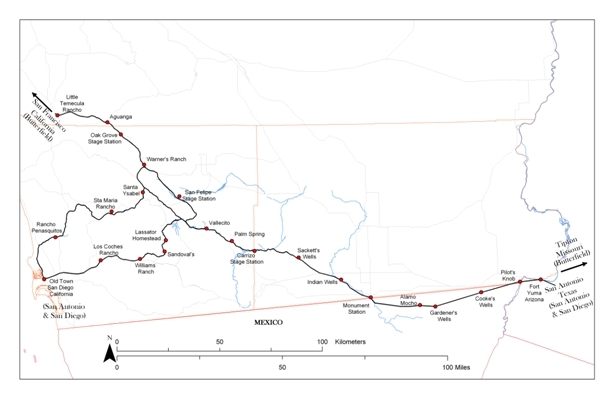 Map of the Overland Mail Routes between Fort Yuma, San Diego and Temecula. The San Antonio & San Diego Mail / Butterfield Stage crosses some 35 miles of the Anza-Borrego Desert State Parklands. Today, driving on paved roads, the park visitor can easily experience vast areas of the Anza-Borrego Desert that in earlier decades were only accessible by foot or on horseback. Commuters regularly travel between Yuma, Arizona and San Diego, California, a trip of less than 8 hours and of no particular hardship. In the nineteenth century, however, such a journey took many days and without proper planning, could be quite dangerous. The delays and hazards not only made travel difficult, but precluded reliable communication. Today, computers and cell phones provide us with instant communication. In the nineteenth century, letters took days to compose and months to cross the Southwest deserts and Midwest plains between the West and East coasts of the United States. In 1850 San Diego, it might have been months before the citizens learned of important news events such as the election of the President or a scientific discovery. Shortly after California was annexed to the United States at the end of the Mexican-American War in 1848, reliable transportation and communication between the West and East coasts became an immediate need. The United States sent expeditions to explore the southern route for transportation and communication possibilities. This southern route had been known by several names since parts of it had first been used by Juan Bautista de Anza. 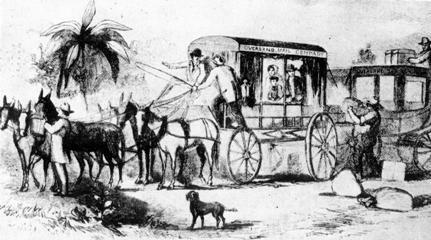 In the early 1800s it was known as the Sonora Road, used regularly by Mexicans traveling between Sonora and California. In the mid-1800s, the United State military expeditions of General Stephen Kearney and Colonel Phillip St. James Cooke traversed the desert along the route to occupy California during the Mexican-American War. In 1849, it became known as the Southern Emigrant Trail, used by thousands of Americans traveling to the gold fields in Northern California. 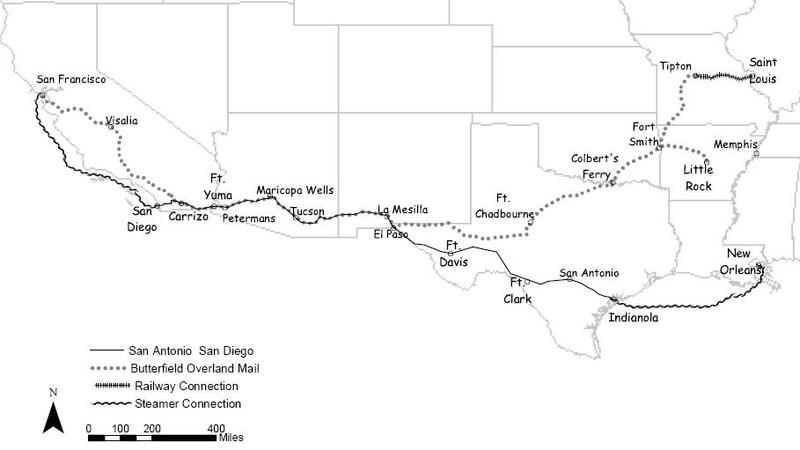 In 1857, the United State Congress authorized the San Antonio & San Diego Mail to establish an overland mail route between the Mississippi River and San Francisco. The first SA&SD mail riders, traveling west from San Antonio, arrived in San Diego on August 31, 1857 establishing the first transcontinental mail line. Additional information is available at this link to Butterfield Stagecoaches. 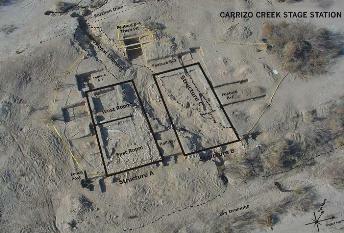 Use this link to View Large Image of Carrizo Creek Stage Station.